Every once and awhile something happens that just touches your heartstrings. A few weeks ago I received an email from a customer who had taken on a labor of love for a little girl who lost all of her personal possessions in the June floods that ravaged the Midwest. Alessandra and Joe Ferrerio didn't know a lot about Samantha, the daughter of an oncology nurse at the hospital, but they wanted to do something special for her that might help alleviate the pain of loss. Samantha is a 12-year-old whose bedroom was in the basement of her Columbus, Indiana home. Needless to say, while she and her family did not suffer personal harm, she lost all those things near and dear to a young lady. Hospital workers and Alessandra's church worked together to replace necessities like a bed and clothing, etc. for Samantha. Alessandra is a nurse at Columbus Hospital in Columbus, Indiana, so she knows first hand the devastation of the floods. Columbus Hospital just opened its ER this week, but it will be months before it is up and running due to the massive damage done to the lower levels. She shared with me some of the stories of the tremendous effort on the part of staff trying to cleanup the hospital and help those who like Samantha and her family suffered from the flooding. She told me the story about receiving a dollhouse kit several years back from a relative of a hospice patient. Although Alessandra and her husband were already building a dollhouse together, the patient's relative told her "you'll know what to do with it some day." 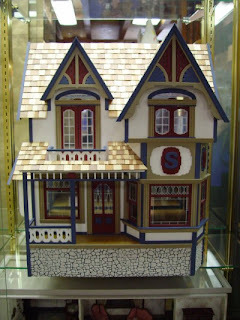 When she remembered the dollhouse and its story, she knew she had found her "something special" for Samantha. I too found those words inspiring and knew I had to help. "It just broke my heart," Alessandra said as she related the scene described by Samantha's dad when she arrived home after the flood (she had spent a couple of days at her grandparent's home). His eyes welled up as he said "when we brought her home she saw all her muddy belongings out on the front lawn and just sobbed and sobbed." "I am sure at 12 your whole life is in your room," Alessandra added. "This will be an opportunity to inspire her to rebuild and stay a kid for a while more. And I imagine her with her own family someday passing on the dollhouse and the story of how it came to her." I haven't done as much as Alessandra and Joe. They did the building and decorating (and a wonderful job at that). I've just tried reaching out to other miniaturists who might share one or two extra pieces of furniture they have on hand to fill the lovely dollhouse for Samantha. To date we have a living room, compliments of Madison Avenue Miniaturists, a N.A.M.E. sanctioned club that meets in Franklin, Indiana; a kitchen thanks to "Army" Armstrong, a kind gentleman who happened to overhear a telephone conversation about Samantha while he was in the shop; and a bathroom and master bedroom (Jeepers own humble contribution). We have received several other offers for items that we expect to receive soon. If you have something you'd like to contribute, contact me at cheryl@jeepersminiatures.com. Thanks to everyone who has contributed. I'm sure we will see one very happy and surprised young lady very soon. We are working on the details of the "reveal." Watch for updates! Our tentative date is August 24, 2008. Click the picture of the dollhouse to see more pictures and watch the progress as we fill the rooms!